The focus of the book is Lean thinking, which is typically applied in a manufacturing setting. 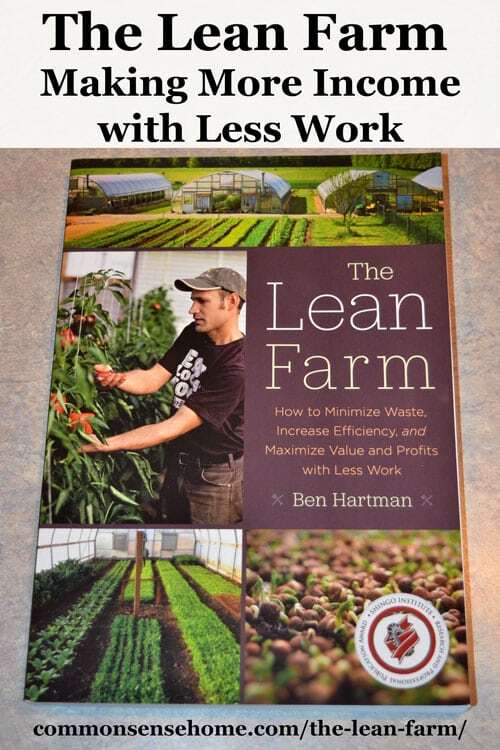 Ben shows you how to use the 5S tools of Lean in a market garden farming. The end result for their business is a farm that makes more income working less land. (Specifically, they now farm less than one acre of their 5 acre parcel.) They are also able to take time off once it a while, which is a rarity for many farmers. Their market garden farm wasn't always like this. Before implementing lean practices, they were facing farming burnout. (I hear a lot of farming friends and readers talking about this.) Working from sunup to past sundown, no vacations for years, too much to sell one week, not enough to sell another – they were worm out, and knew they needed to make a change. Luckily a friend who owned a manufacturing business took them under his wing and suggested they try implementing lean principles on the farm. It hasn't always been easy, but the results are worth it. “5S” is the system of practices that guide lean thinking. In Japanese, it's seiri, seiton, seiketsu, and shitsuke. In English, the terms are: sort, set in order, shine, standardize, and sustain. Farm , market garden, homestead or home – “stuff” creeps in, piles up and slows us down. The first step of lean teaches to sort through your stuff and get rid of anything that's not absolutely needed. It's so tempting as homesteaders to hold onto different tools we've tried, things we've been “gifted” (or had dumped at our place), and anything else that comes in “just in case we need it”. If you spend time on a regular basis working around things or having a hard time finding the right thing, odds are stuff needs to go. 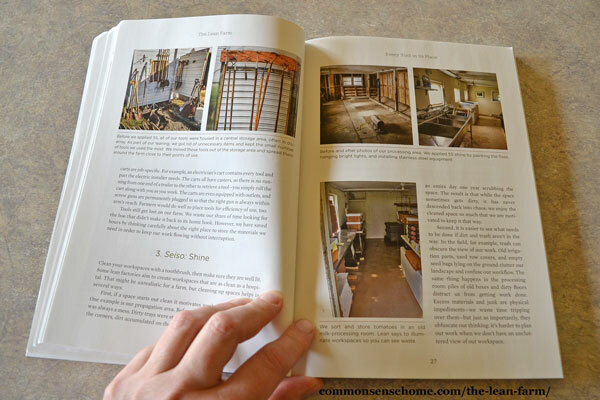 This section outlines tactics for “thinning the herd” of tools and other items. This is an ongoing challenge on our homestead. I was raised poor, and you never got rid of anything that *might* be useful. The thing is, your time is worth money, too. Every time clutter gets in the way, you lose time you'll never get back. Clearing clutter also helps clear the mind. (There's a proven link between clutter and depression.) After reading this section, I went through the house and made up several “donate” stacks. They've moved on to new homes, and more items will continue to follow. “Every tool on your farm should have a place.” If you take nothing else from the book or this review, implement this. Without a system of organization, you consistently waste time looking for the right tool or moving tools from one place to another. East of access, frequency of access and visibility are key points to consider. A clean, well lit, well organized workplace makes tasks easier, and farming is no exception. If you start with a clean area, it's easier to keep it clean, too. (And any workers coming in can easily see what an area should look like before they start.) How many of us have corners where things stack up, or a hodgepodge of bins, buckets and boxes that always look like a mess? Get rid of stuff, organize, clean. The processing room makeover Ben shares in a book is a thing of beauty, and gave me plenty of ideas for redoing our own smaller scale processing areas. Standardize tasks, standardize equipment. If you have things set up correctly, someone walking in should be able to get done what needs doing with minimal or no assistance. Task list, storyboards, photos of how a space should look, labels, standardized bins – figure out the best way to get tasks done, and make it easy for everyone to do things that way. Once everything is in place, there should be an ongoing commitment to improvement. You want to keep your work areas free of clutter. Everyone involved in getting things done can make suggestions for better ways to complete tasks. Set meaningful goals, and check that you are meeting those goals. If not, why not? Every mistake or goal missed is a chance for improvement, but unless you set goals, you don't know what you are working towards. Surviving is not thriving. Every step in production must be identified to determine what adds value to the end product. After introducing the foundation of lean in chapter one, Ben goes on give real world examples of how to implement them. As I mentioned at the beginning of the post, sometimes you need to look at your situation with a fresh perspective. This book can help supply that perspective. 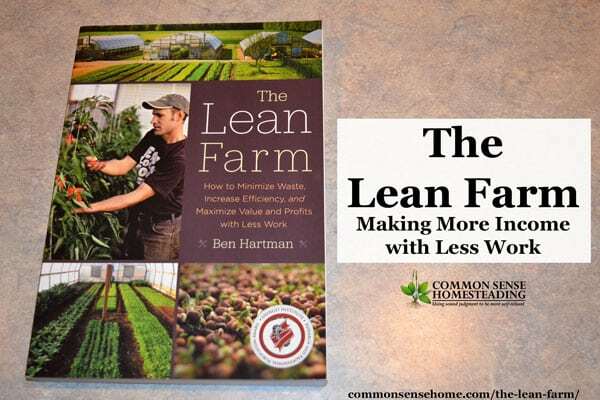 There's also a critical section about Lean Farm Sales. Too often, we grow what we want to grow or are good at growing, and then try to sell it. This does create product, but it's a lousy way to run a business. The Big Boys study consumer trends and demands, and tailor their products to meet those demands. The small farmer has to do the same thing, and hopefully do it better. We can't rely on volume to make up for tiny margins. That's a good way to work yourself into an early grave. It's our job to educate the consumer about the value of our product compared to conventional products, but we also have to make sure that we're producing what people want. Ben gives ideas for how to do exactly that. There are section on working with employees, applying lean as a start up, and the limits of lean in an agricultural context. There are not specific case study applications for animal production (Ben is a market gardener), but the same base concepts are valid no matter what your product stream. 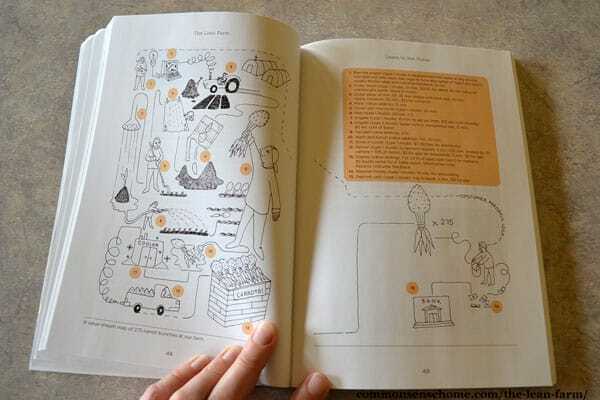 If you find yourself struggling with “overwhelm” or wondering if you can make a living off of small acreage, The Lean Farm is an excellent resource to help you get (and stay) focused to survive and thrive. The successful old timers used to do this sort of thing intuitively, but now we have a guide book to help the new generation of farmers. I was provided this book for review by Chelsea Green Publishing. As always, my opinions are my own, and I hope you find it as useful as I do. Good point about de-cluttering. That is my worst sticky point, getting to the point where I feel like I am fully organized and if necessary, over-equipped to do the job. My tendency is to intend to do a project once so I don’t have to do it again. When it works, it works great and saves a lot of time. Unfortunately, this does not work well for anyone who lives in a house and uses dishes! It has taken a while for me to admit to myself that it is an insane operating strategy, though appealing for someone who tends to take on big projects. I sincerely want to know if the author discusses a process for unbraiding this kind of craziness out of our psyches? Yes, Ben does share an assortment of strategies they used on their farm. When they first got started, they tried a lot of different equipment – much of which ended up sitting around not being used because they found something else that worked better for their situation. Wading through all of it was the first thing they tackled. Once they got through the obvious stuff, it was on to items that were “on the fence”. There are marking and sorting systems shared that help you to identify what to keep and what to clear in a way that makes it obvious even to the reluctant clearer. The problem with this country is that there are too many middlemen in agriculture ! ! ! ! Every one of them has to get a portion of the proceeds ! ! ! ! ! Unfortunately the Farmer doesn’t get his fair share of the profits, and therefore has a negative income ! ! ! Too many fat cats sitting on their a**es on the phone buying from supplier “A” and selling to seller “B” for a profit, in other words… doing nothing and making money ! ! ! This just isn’t fair to the “FARMERS” or the “CONSUMERS”, farmers don’t get enough for their produce and the consumers have to pay through the nose for theirs ! ! ! There has got to be a better way ? ? ? ? “FARMERS MARKETS AND CO-OPS” help to a certain degree, but this still isn’t enough ! ! !